SummaryReviews (45)Questions (2)Is this product right for you? It’s easy to say goodbye to harsh hot tub chemicals. If you're already striving for a chem free lifestyle use minimal lotions/detergents, invite occasional friends to bathe and have regular maintenance practices your an ahhNatural PURIST. Get ready to experience hot tub bliss. ahhNatural will transform your hot tub back to what nature intended, a natural restorative mineral bath that leaves your skin smooth, your body rejuvenated and our planet a little less stressed. All you'll need is 1 pint of 3% hydrogen peroxide every 2 weeks. About $2 a month. ahhNatural is an easy-to-use natural hot tub maintenance product based on the same advanced technology commonly used in the water purification industry. ahhNatural has been perfected in over ten years of research and development. 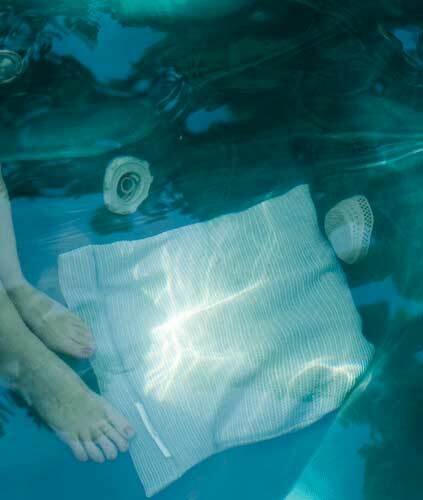 A 16 X 16 inch mesh tea bag containing naturally occurring minerals, ahhNatural controls bacteria growth, absorbs organics like sweat and purifies hot tub or spa water for up to one year or more. ahhNatural works continuously 24/7/365 eliminating the chemical roller coaster. ahhNatural allows you to soak chemical free. ahhNatural restores your hottub back into the spa water that nature intended. The ahhNatural kit is a complete 1 year system (most customers are getting a year and a half), all you need in addition is 1 pt of 3% hydrogen peroxide every 2 weeks, about $2 a month. Keep your old watering your tub so you can detox or purge all the hot tub chemicals and organic build up deep within in your spa before you start using ahhNatural. The EPA requires us to recommend periodic shocks of Chlorine or Bromine (classified as pesticides by the way!). We say use your common sense, don't bathe in any water that is suspect - including chemical soup! From Carol of Ann Arbor, Michigan on 10/3/2018 . From Francisco of Kula, Hawaii on 9/12/2018 . From sue johnson of alameda, California on 8/14/2018 . Non-toxic Home birth with ahhNatural! From Katy Brown of Windsor Heights, Iowa on 7/7/2018 . From J of Aquinnah, Massachusetts on 11/26/2017 . From Anonymous of Cadillac, Michigan on 11/9/2017 . From Anonymous of San diego, California on 8/12/2017 . From Winks of Sacramento, California on 5/10/2017 . From Tim of Cove, Oregon on 4/14/2017 . From Jay Bodnar of Chilmark, Massachusetts on 12/29/2016 . From Amy C of Tucson, Arizona on 12/9/2016 . From Darlene of Newport, New Hampshire on 11/30/2016 . From Kimberly Hughes of Mill Valley, California on 10/14/2016 . 2/15/2017 – How is the bag attached to the bottom of the tub..and is it necessary to drain existing water before using this product.. . . .